20"/50cm,2008, Hardly any other bear has ever brought so much spontaneous enthusiasm to little as well as big animal lovers as the panda. His typically patterned, black and white fur is always a feast for the eyes. The love story between man and panda began in 1938 when the first bears fascinated visitors in English and American zoos. The cute and furry fellow has also made a lasting impression at Steiff as well. He was already produced as a sample animal in 1938 and then as a registered design. 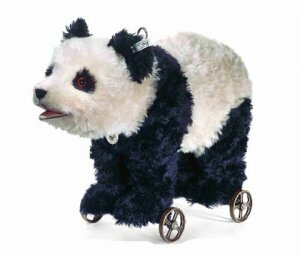 And now the Steiff panda is celebrating his big comeback in every aspect: as an impressive, beautifully crafted, classic pull-toy replica on cast iron wheels. The hearty panda with the cuddly soft fur made of finest mohair, firm stuffing made of wood shavings, glass eyes and his impressive pull-string voice is another wonderful piece in the Steiff pull-toy animal series.